Jeff Gural signed a deal with Betfair US for Meadowlands and Tioga Downs this week. Meadowlands owner Jeff Gural said at a press conference this week that the US Supreme Court decision to allow state-level legalized sports betting gives his racetrack another chance to success. Gural said, when he heard about the SCOTUS decision, he felt like a death row inmate who received a reprieve from the governor. 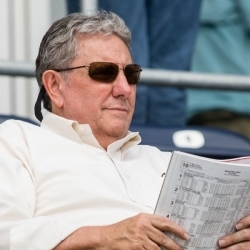 Jeff Gural, who also owns Tioga Downs Racetrack in Upstate New York, said he is not sure if legal sports betting will save the Meadowlands Racetrack or not. At the very least, it is “a good start”, said the 75-year old New York real estate developer. In 2016, Jeff Gural was one of a handful of gaming executives who pushed for the North Jersey casino referendum. At the time, he thought a casino on the grounds of the Meadowlands Racetrack in East Rutherford was the only chance his gaming venue had of survival. At the moment, Meadowlands hosts the annual Hambletonian race, a million-dollar which kicks of the Triple Crown of Harness Racing for Trotters on the first Saturday in August. Called the “Father of the American Trotter”, the Hambletonian Stakes has been hosted at 6 different venues in 4 different states since it began in 1926. The race moved to the Meadowlands Racetrack in 1981, after it was hosted at the Du Quoin State Fair in Du Quoin, Illinois since 1957. Despite the $1,000,000 purse, Jeff Gural says the Hambeltonian Stakes is failing — as is Meadowlands Racetrack. Jeff Gural says Meadowlands loses millions of dollars a year. For years, the state of New Jersey subsidized the races, ostensibly to help keep the struggling horse training industry alive in the state. Last year, Gural said that Gov. Chris Christie stopped subsidizing New Jersey horse races, though Pennsylvania poured $200 million in tax dollars into their horse racing industry. Gural says his track cannot afford million-dollar purses into perpetuity, if he cannot generate cash throughout the rest of the year. That was why Gural wanted casino-style gambling at the racetrack, much like many other US states have turned their racetracks into racinos. For the past 40 years, Atlantic City has maintained a casino-gaming monopoly in New Jersey. Despite the pessimism, Gural says that sports betting should help business. The Meadowlands Sportsbook is going to be the only bookmaker operation in the New York City greater metropolitan area — at least for the time being. A large number of New Yorkers are likely to visit the sportsbook to make wagers on NFL, NBA, and MLB games throughout the year. Towards that end, Jeff Gural signed a deal with Betfair US to operate a sportsbook on the Meadowlands grounds. Betfair US is the United States subdivision of Paddy Power-Betfair, a large Irish land-based sportsbook which runs an online bookmaker operation. Paddy Power-Betfair is the result of a merger between the Dublin-based sportsbook, Paddy Power, and the Gibraltar-based UK sports betting exchange, Betfair. The two groups merged in 2015, with Paddy Power shareholders gaining 52% of the merged company and Betfair shareholders receiving the other 48% of the company. Meadowlands and Jeff Gural has a longstanding business relationship with Betfair, or at least one of its subdivisions. In 2008, Gural’s two racetracks signed a broadcast deal with TVG Network, the US broadcasting wing of Betfair. TVG was a part of the 2015 merger. The Meadowlands-Betfair US-TV Network deal should be a major revenue source for Jeff Gural’s sportsbook. Especially when the fall arrives, New York football fans should flock to the Meadowlands to bet on NFL and NCAA football games. Will Legal Sports Betting Help the NFL? Jeff Gural said legal sports betting in cities across the United States should be a huge boon for the NFL. Coming off two years of declining ratings, legal sportsbooks could be just the factor NFL Commissioner Roger Goodell needs to reverse the trend. Whether that will be the case remains to be seen. At the moment, the NFL and its fellow major sports leagues appear ready to lobby the US Congress for a 1% integrity fee, setting up another potential adversarial stance against American sportsbooks. It could be a short-sighted move, since legal sports betting with a healthy bottom line would increase NFL ratings, thus increase their bargaining power during the next television contract negotiation.